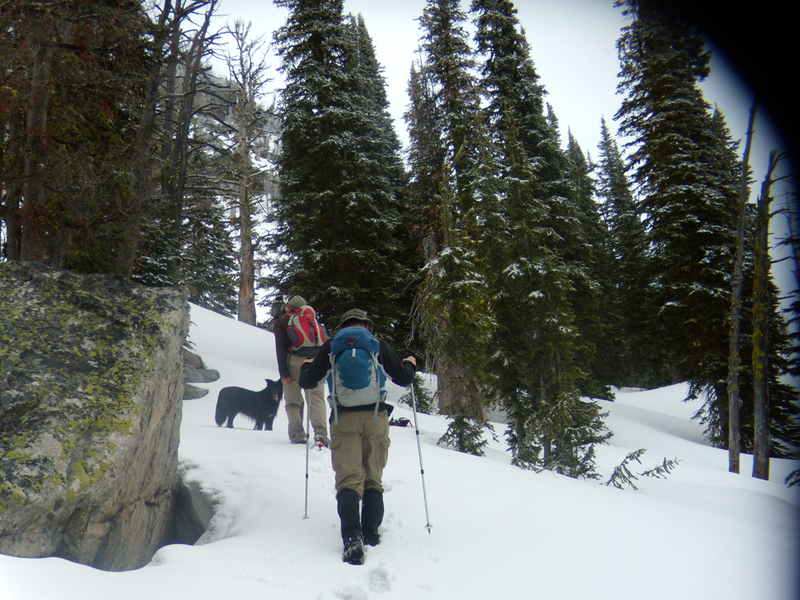 A family tradition around Memorial Day, this hike to Golden Lake was our snowiest ever. 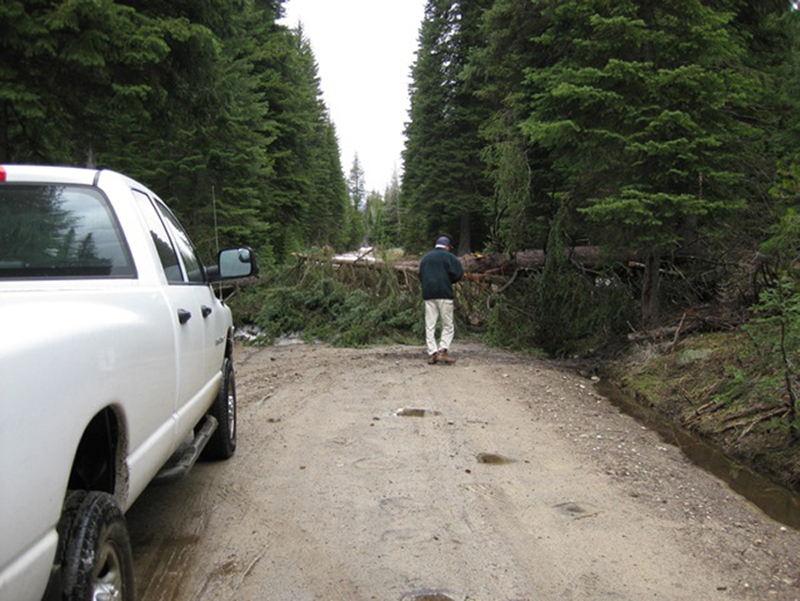 Dad, who lives near McCall, had driven up the road to check the conditions. He found this tree blocking access, just past Slick Rock. Matt and I got to the tree first, where we listed in a grouse 'drumming' while we waited. The first order of the day was to clear the blockade. As soon as we got out of the car, it started raining. We spent about an hour sawing, pulling, rolling, and digging, but finally had a path we could drive through. After all that work, we got maybe 1/4 mile farther up the road. And of course, it quit raining as soon as we were done working on the tree. We consoled ourselves, saying that at least the clear road would encourage the four-wheelers to stop going around the tree and shredding the soft spring ground. So we parked about a mile shy of where we can normally get to, and started walking the road, where we followed a very intact set of bear prints. The day was overcast and humid, but all and all not bad. The trilliums were just out, and everything seemed very green. We had our normal issues trying to find the "trail," but made pretty good progress getting through the initial trees and into the open rocky area above. Matt was excited to get his first real view of this area. 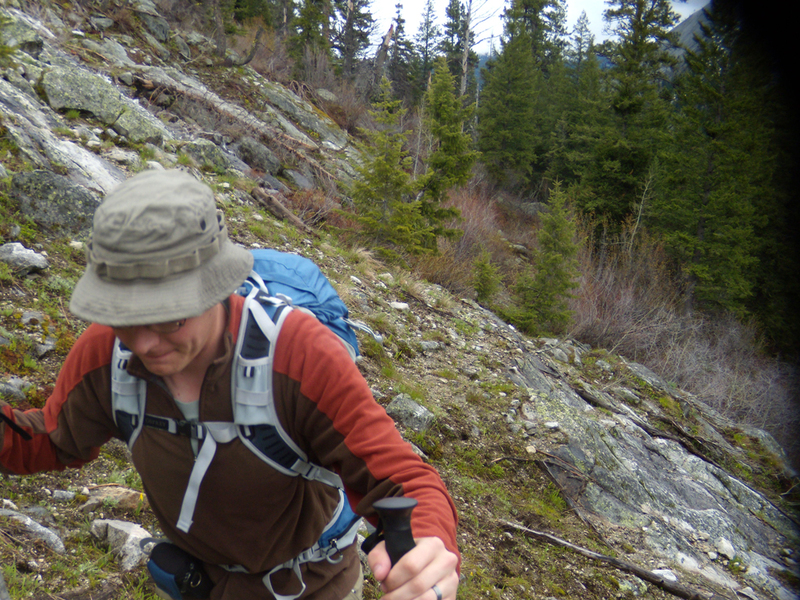 He had hiked part way up Snowslide Creek, but hadn't been high enough to get the overview. I didn't take a lot of pictures up the trail, as I had lots of them already. But here is Dad and I at Golden Lake, about 2:45 after leaving the cars. 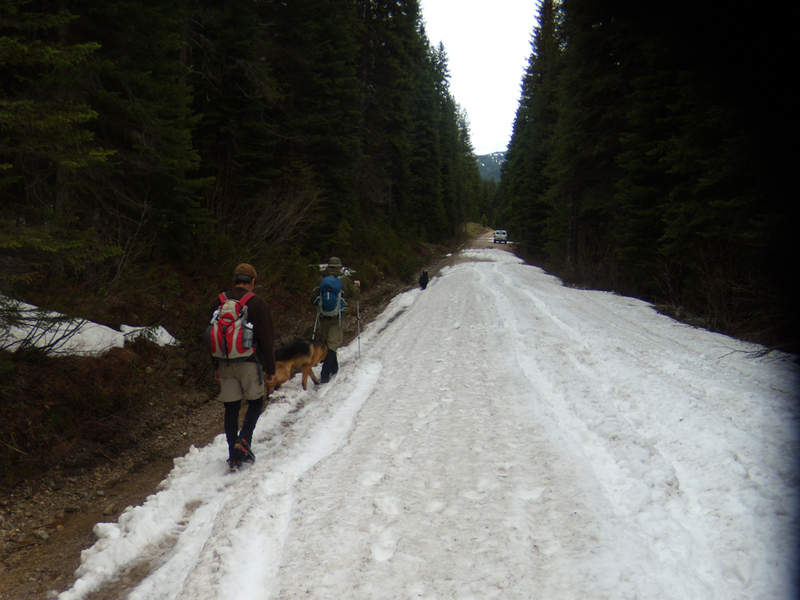 A little slower than past hikes, but we started a mile farther down the road, there was more snow than usual, and Dad is 80. And hasn't been hiking much. Still, not bad for 2000' of gain? 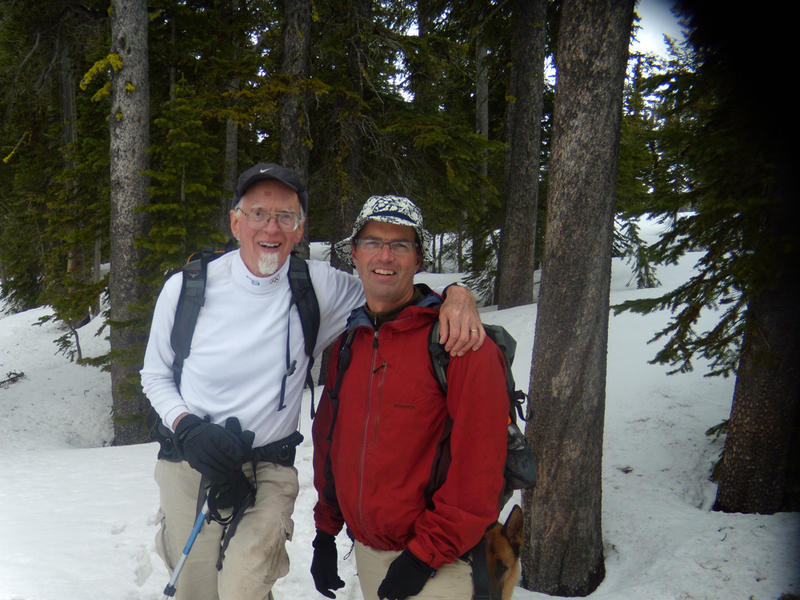 As I said, Dad hasn't been hiking much so he decided to turn around while Art, Matt, Sammy, and I continued on toward Snowslide Peak. The snow was little soft on top for about 6", but mostly firm underneath. We made good progress, but the clouds were now descending. 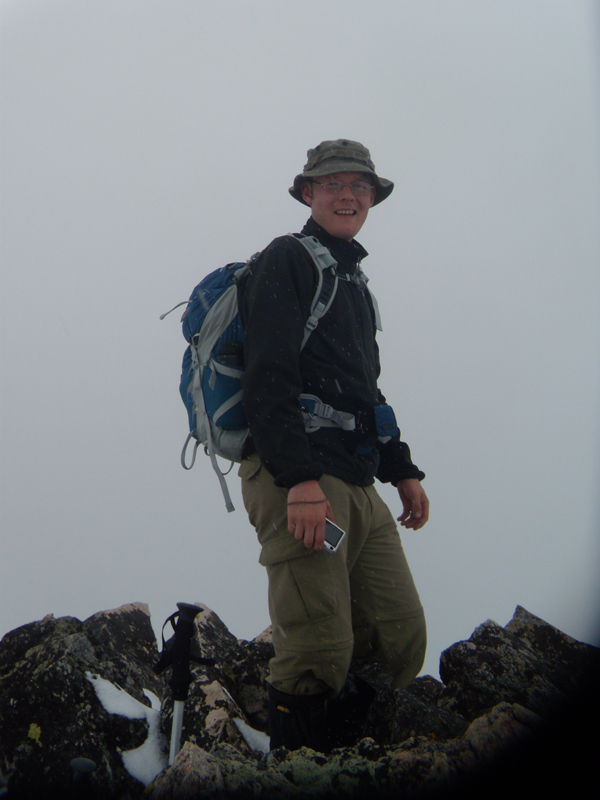 When we got to the summit, the visibility was down to about 100 yards. Art and I told Matt over and over how wonderful the view was from this spot. He didn't appreciate our help. Then it was time to head down. 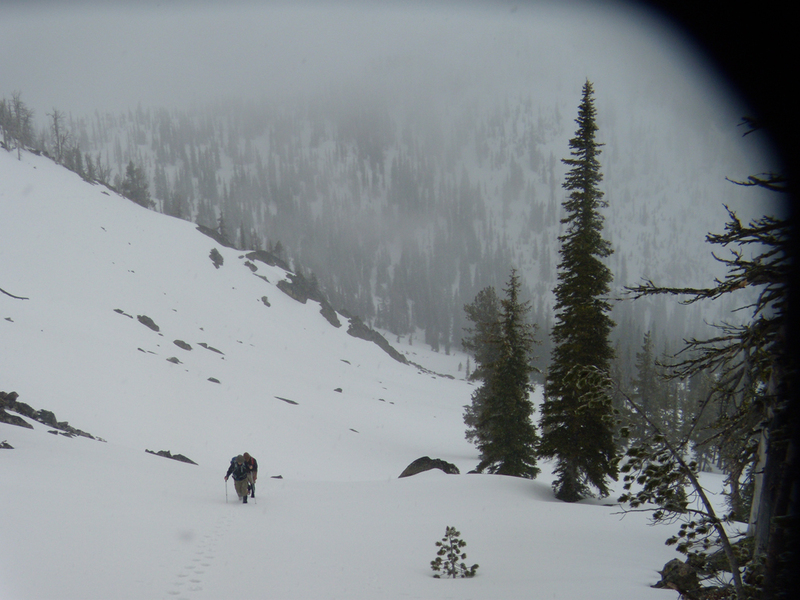 When we got below the lake, the visibility started to improve and we saw a few small patches of blue sky. 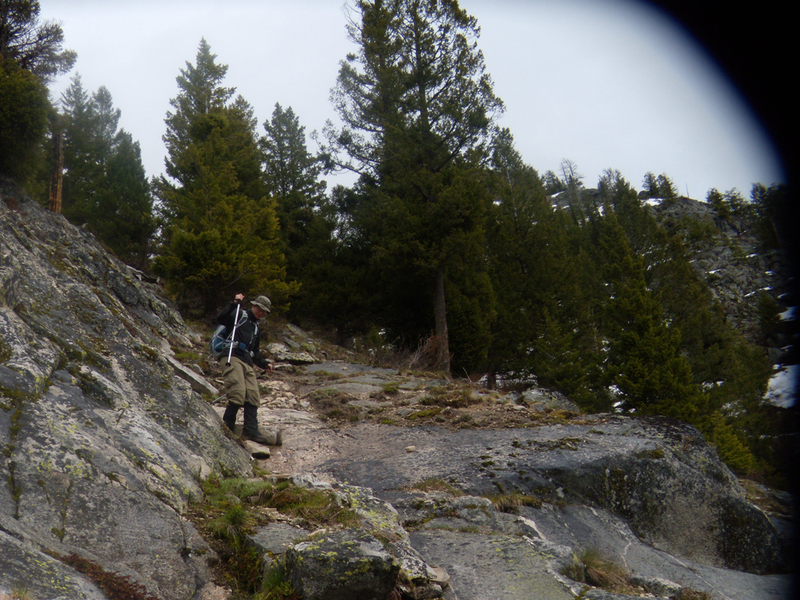 We did a better-than-average job of following the trail, only having to backtrack once or twice. We caught up with Dad just before hitting the real road at the bottom, then all four of us walked the mile or so back to the rigs. As we neared McCall, we could look back and see the summits. Oh well, that's spring in the mountains.